A major fiberglass repair, such as patching a hole, can be a daunting task. Watching a professional do the job can help you get on the right track and be confident in doing the repair yourself. This step-by-step video tutorial produced by Sea Hawk Paints will show exactly what needs to be done when patching a hole in your fiberglass boat. Note: Before attempting a repair by yourself, get a professional opinion. Always wears Personal Protective Equipment when sanding or working with chemical compounds! Respirator, safety glasses and gloves are always recommended. 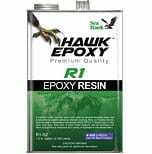 Hawk Epoxy Resin Kit – It contains the epoxy resin, catalyst and filler for the job. 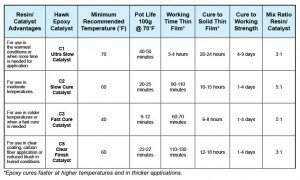 How Do I Choose Hawk Epoxy Catalyst and Fillers? This entry was posted in Boat Repairs, Fiberglass Repair, Hawk Epoxy and tagged epoxy resin, fiberglass hull, fiberglass repair, Hawk Epoxy, hole repair, patch hole, sea hawk on August 19, 2016 by Dustin Wilber. What is the best way to achieve maximum adhesion when replacing your boat’s hardware? This How To article will give you the basic knowledge you need to get your repair done correctly. Note: Before attempting a repair by yourself, get a professional opinion. Always wears Personal Protective Equipment when sanding or working with chemical compounds! Sand both the surface and the hardware to get maximum adhesion. Wet out the surface with Hawk Epoxy. Wait a few minutes for it to soak in. Wet out the Hardware base with Hawk Epoxy. Mix another batch of Hawk Epoxy with F2 Structural Adhesive Filler. Coat the hardware base, screw threads, and surface mount with the epoxy/filler compound. Tighten hardware bolts until some epoxy mixture squeezes out. Use your finger to fillet the excess mixture around the hardware base for extra strength. Before using the hardware, allow the bond to cure overnight. This entry was posted in Boat Repairs, Fiberglass Repair, Hawk Epoxy and tagged boat repair, epoxy resin, f2 filler, hardware bonding, Hawk Epoxy, sea hawk epoxy, sea hawk resin on August 16, 2016 by Dustin Wilber. Fairing is process of smoothing out and restoring the damaged surface of the hull. A fairing compound such as Epoxy resin can be used to fill in divots or gouges and then be sanded to a smooth finish. This restores the surface to its original shape and also prepares it for painting. Sand all loose surface debris and hard edges. Rid surface of debris with clean cloth. Wet out surface with Hawk Epoxy. 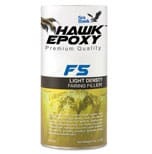 Mix another batch of Hawk Epoxy with F5 Light Density Filler and apply to repair area. Use long strokes to spread out filler compound over the damaged hull. Apply until the mixture is slightly raised above the hull surface. Make sure the compound extends beyond the repair area. Add skim coat of F5 Filler / Epoxy compound to achieve a very smooth surface. Let cure. Sand the repair to the desired shape with 80 grit sandpaper. Finish by applying another 2 or 3 layers of Hawk Epoxy Resin. The surface is ready to be painted! This entry was posted in Boat Repairs, Fiberglass Repair, Hawk Epoxy and tagged epoxy resin, F5, Hawk Epoxy, hawk filler, hull imperfectionsfairiing compound, light density filler on August 16, 2016 by Dustin Wilber. Below shows the comparison of the West System products to the Hawk Epoxy products. 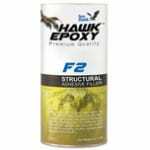 Hawk Epoxy is comparable to the West System with how it works and its uses. West System is known for A/B/C/D selection system size (Size A resin with Size A hardener) the Hawk Epoxy uses 1/2/3/4 (Size 1 resin with Size 1 catalyst). The pumps are sold separate with West System and Hawk Epoxy, this works where 1 pump of resin is mixed with 1 pump of catalyst, or more depending on instructions. This is just to make it easier and less chance for error for the customer and it doesn’t mean a 1 to 1 ratio because the pumps are calibrated differently and each pump size can distribute different amounts. Please Note: This chart simply shows the likely equivalent product by brand. 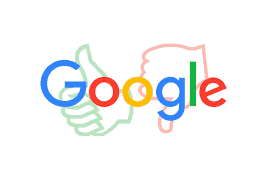 It is not recommended to mix the products brands. CLICK HERE: West System to Hawk Epoxy Cross Reference Guide. West System and Hawk Epoxy are trade marks of Gougeon Brothers, and New Nautical Coatings, respectively. This entry was posted in Epoxy, Hawk Epoxy and tagged cross reference guide, Hawk Epoxy, hawk epoxy by sea hawk paints, hawk epoxy cross reference guide, west system, west system cross reference guide on October 9, 2014 by Jason Revie. R1 Epoxy Resin – a smooth, low-viscosity liquid epoxy resin. 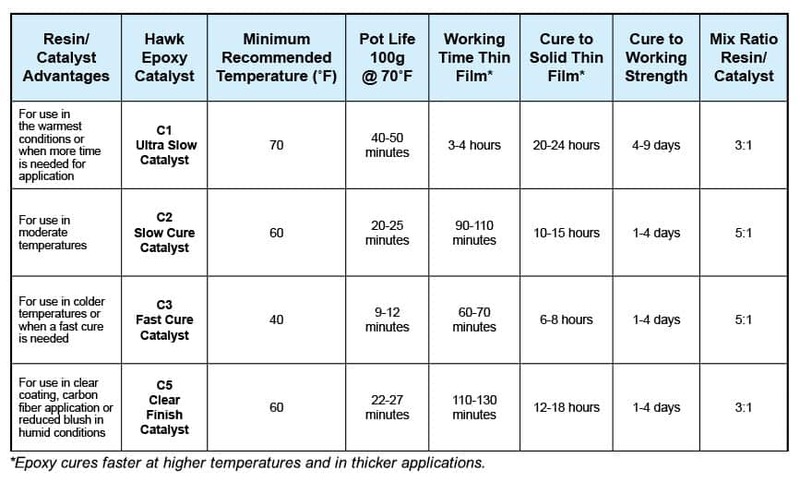 With a variety of Hawk Epoxy Catalysts, it can be cured under a wide range of temperatures and environmental conditions to form a high strength plastic with superior moisture barrier characteristics. Hawk Epoxy is available in four system sizes color coded on each label. Note: Mix ratios vary by catalyst. For optimal product utilization, be sure to choose the same Size for both the resin and catalyst. I.e Size 1 Resin with Size 1 Catalyst. C1 ULTRA SLOW CURE CATALYST: Designed for use with HAWK EPOXY R1 Resin for construction and repairs with superior adhesion, strength, bonding, filling, and moisture barrier qualities at higher temperatures and for an ultra slow cure. Do not use under Sea Hawk marine wood varnish. C2 SLOW CURE CATALYST: Designed for use with HAWK EPOXY R1 Resin for construction and repairs with superior adhesion, strength, bonding, filling, and moisture barrier qualities at higher temperatures and for a slow cure. Do not use under Sea Hawk marine wood varnish. C3 FAST CURE CATALYST: Designed for use with HAWK EPOXY R1 Resin for construction and repairs with superior adhesion, strength, bonding, filling, and moisture barrier qualities at cooler temperatures and for a fast cure. Do not use under Sea Hawk marine wood varnish. C5 CLEAR FINISH CATALYST: Designed for use with HAWK EPOXY R1 Resin for very clear fiberglass cloth and coating applications with exceptional moisture barrier characteristics. Perfect for natural wood and carbon fiber clear coats with no blush. Longer working times in very warm temperatures. May be used under Sea Hawk marine wood varnish. TIP* For easy accurate measuring be sure to use the Hawk Epoxy Pumps that are calibrated to dispense the correct amount of resin and catalyst. This is much easier and leave little room for mistakes. F1 High Load Adhesive Fiber Filler – Thickens to a light grey color creating an easy to use adhesive designed for bonding hardware and other applications with dissimilar materials. This mixture will maximize bond strength for anticipated high loads. F2 Structural Adhesive Filler – Thickens to an off white color, creating a general purpose thickening additive for bonding, gap filling and filleting. Mix to a workable consistency allowing sag-free and easy flow properties for vertical and overhead applications. F-3 Light Density Adhesive Micro Fiber Filler – Thickens to an off white color. Great for bonding many substrates, especially wood. The mixture also creates a multipurpose adhesive for many other substrates in addition to providing excellent substrate wetting and penetrating characteristics. Increases impact and abrasion resistance. F4 Bridging Adhesive Filler – Thickens to a brown color, creating an easy to use adhesive with excellent gap filling and filleting qualities. This mixture blends with many different types of wood to allow for a natural looking fillet or gap fill. F5 Light Density Fairing Filler – Thickens to a reddish brown color, achieving an easy to sand and carve fairing compound while still remaining strong and light weight. F6 MicroSphere Fairing Filler – Thickens to a white color, creating a lightweight fairing compound for small to large areas. This product holds a feathered edge very well and is suitable for nearly every substrate. This closed celled structure can also be used for increased acoustic and thermal insulation. This entry was posted in Boat Maintenance, Boat Repairs, Epoxy, Fiberglass Repair, Hawk Epoxy and tagged Hawk Epoxy, hawk epoxy catalyst, hawk epoxy filler, hawk epoxy resin, sea hawk epoxy on October 9, 2014 by Jason Revie.